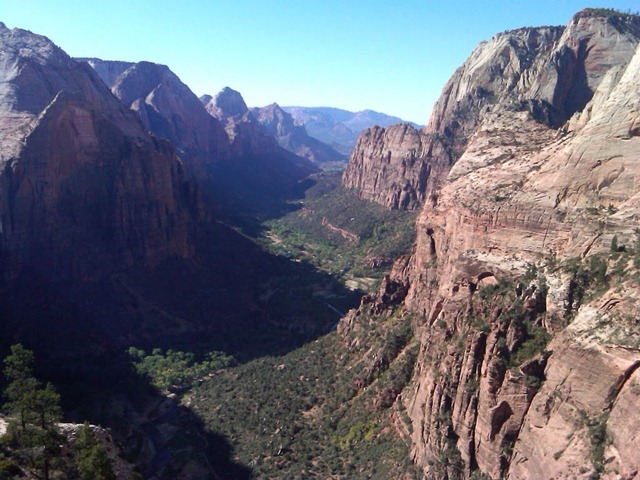 Zions N.P. 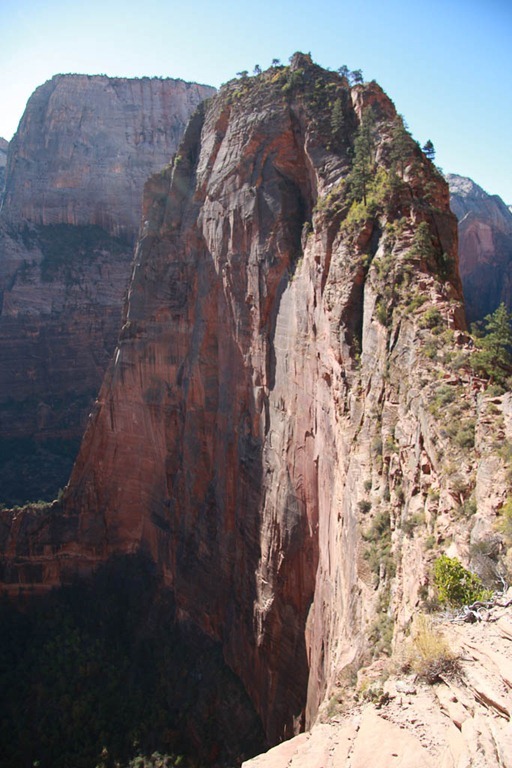 – Angels Landing and Backpacking down the Narrows. 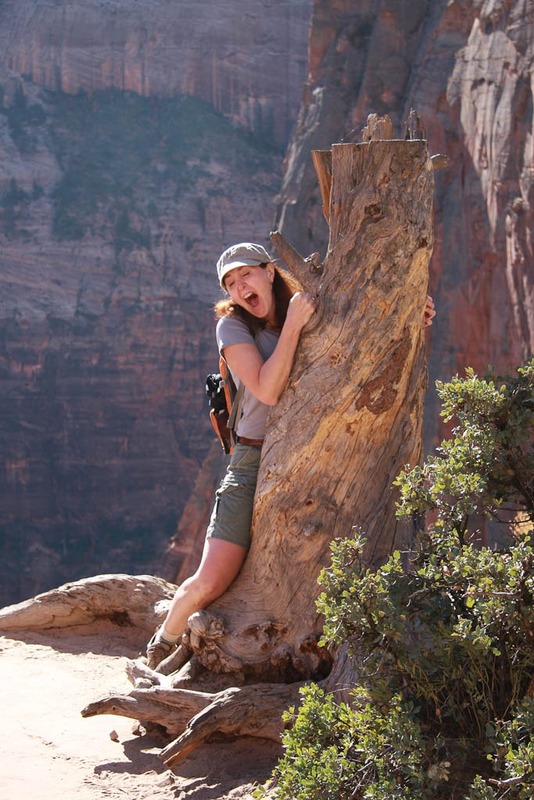 Over the past weekend I took a trip with my mom and her husband down to Zion’s National Park in Southern, UT. I’ve been there several times before but this time we wanted to hike down the narrows. We got down to the park at 6:30 AM Friday morning so I could get in line at the back country office in hopes of getting one of the 5 remaining camp sites. I was 8th in line but luckily they were all wanting to do different trips such as the subway or fantasy canyon (I want to do both). So when I got up to the window I had a pick of the remaining sites. I went ahead and chose # 11 since it was the farthest camp site. I wanted to do the majority of the hiking the first day and then have a shorter hike the second day. Turns out I should have gotten one of the other sites though since ours was one of the more open sites to everyone passing through. If I had my pick again I’d choose #8, or anything but #10 or #11. 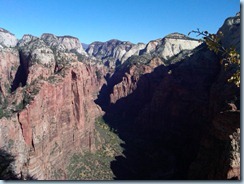 After getting our spot and setting up camp in South Campground we decided to hike Angels Landing. 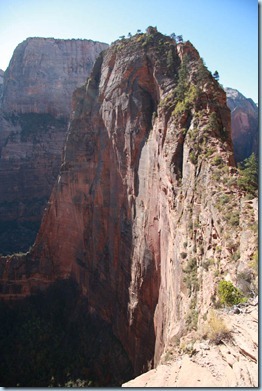 It is an amazing hike where you basically have to climb the spine of one of the cool rock formations (pictured below). I was amazed that my mom decided to come along with me to the top since she’s afraid of heights. But she made it up and it wasn’t as bad as either of us had thought it would be. 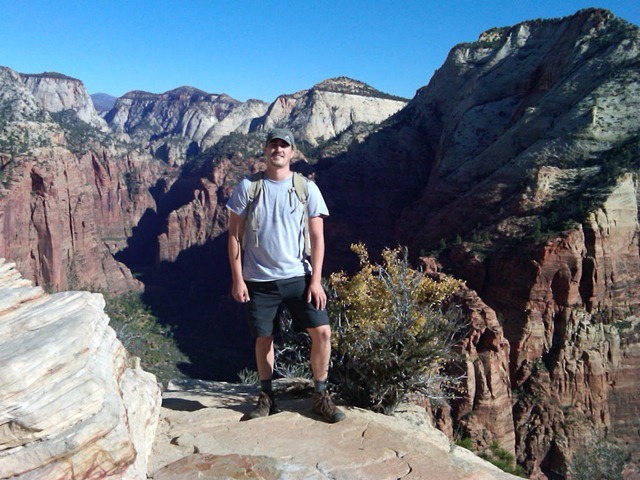 After hiking Angels landing we went into town and grabbed a burger and beer at Oscars Cafe (I’d highly recommend it). That evening we got outfitted from Zion Adventure Company and reserved the shuttle to take us to the top of the narrows Saturday morning. We started the shuttle at 6:30AM Sat morning and arrived at the trailhead around 8AM (Not sure since I didn’t have a watch). From there we suited up in a dry suit and wet socks and shoes that we had rented from Zion Adventure Co. Then we threw on our backpacks and headed down the cold trail. It was cold enough that morning that my mom’s camelback hose had frozen so she had to use mine which for some reason had not frozen yet. As we hiked down the canyon and into the narrows many of the leaves around us had been turned and were all sorts of colors. It was quite beautiful and I must say we timed it pretty well for a full range of fall colors above but yet lush green trees and ferns towards the end. The first day we only had to go through knee deep or so waters. We reached our camp around 4PM and set up our tents then took a nap. Later that evening one of the groups that had taken off the same time as us came through our camp on the way to their own. Most of them were pretty miserable since they were ill prepared and most of them were wearing hiking shoes and regular socks. Most of them were soaking wet and it looked like their gear was wet too 😦 I must say I’m glad we got outfitted at Zion Adventure Co. It made for one pleasant trip. The next morning we woke up at dawn and packed our things then headed out. within a half a mile we were wading through waist deep pools of water. Then we had to climb around and down a rock to get past a beautiful waterfall (Picture in the album below). We also passed a spring that had waterfalls flowing out of it. 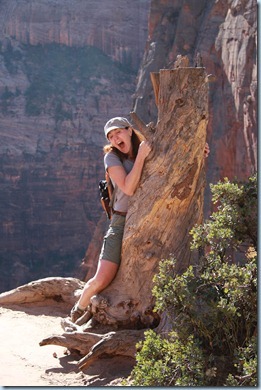 I ended up making it out of the canyon without getting very wet but both my mom and Richard didn’t fare soo fortunate. Both of them had taken a tumble on the slippery rocks. My mom made it within a block of the end of the trail before she had taken a dive. It turns out her knee decided to give out on her since it was still weak from the total reconstructive surgery she had had earlier this year. We made it out at around 1:30 PM on Sunday then headed back to Oscars for a celebratory beer and burger. Then for the 9 hour drive back to Vernal. 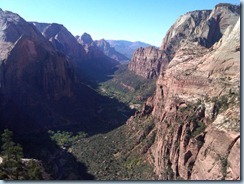 Zion Adventure Company – Great place to rent gear and get the shuttle for the narrows. That pic of mom is freaking hilarious! Great photos, I\’m very jealous!